As demand for Internet content on television increases, service providers and consumer electronics manufacturers need alternative technologies to the traditional up/down/left/right remote control in order to delight consumers with new interactive experiences on TV. 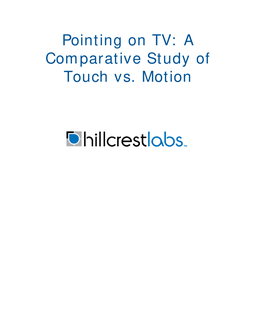 This paper describes why pointing is the right solution for controlling the TV experience, and compares two technologies that enable pointing remote controls: touchpad and motion control. A series of studies compare these two methods of pointing for two common use-cases: navigation and casual gaming. Results show that pointing by motion is superior to pointing with touchpad for both use-cases.